448 pages | 150 B/W Illus. Shipping flows – maritime ‘footprints’ – remain underexplored in the existing literature despite the crucial importance of freight transport for global trade and economic development. Additionally, decision-makers lack a comprehensive view on how shipping flows can be measured, analyzed, and mapped in order to support their policies and strategies. This interdisciplinary volume, drawing on an international cast-list of experts, explores a number of crucial issues in shipping data estimation, construction, collection, mining, analysis, visualization, and mapping. Advances in Shipping Data Analysis and Modeling delivers several key messages. First, that in a world of just-in-time delivery and rapid freight transit, it is important to bear in mind the long-term roots of current trends as well as foreseeable future developments because shipping patterns exhibit recurrent, if not cyclical and path-dependent, dynamics. 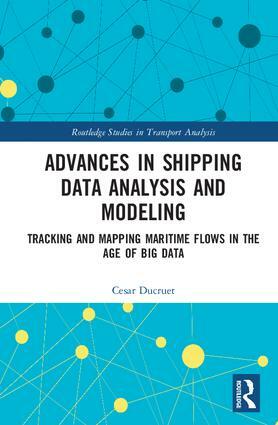 Second, shipping flows are currently often understood at the micro-level of intra-urban logistics delivery and at the national level using commodity flow analyses, but this volume emphasizes the need to expand the scale of analysis by offering new evidence on the changing distribution of global and international shipping flows, based on actual data. Third, that this multidisciplinary approach to shipping flows can shed important light on crucial issues that go beyond shipping itself including climate change, urban development, technological change, commodity specialization, digital humanities, navigation patterns, international trade, and regional growth. Edited by experts in their field, this volume is of upmost importance to those who study industrial economics, shipping industries and economic and transport geography. César Ducruet is Research Director at the French National Centre for Scientific Research (CNRS) & UMR 8504 Géographie-cités laboratory, Paris, France. His work focuses on transport geography and network science with applications in Europe and Asia.